I have seen quite a few what a called merged Easel cards. I was determined to figure out how to merge the image to the top where it bends and have it cut correctly and after 2 hours I did it. I kept it very simple for my first card. I will try to some that are more detailed in the very near future. I think overall it turned out rather cute for my first try. Let me know what you think. Hop on over and link up today by clicking here. 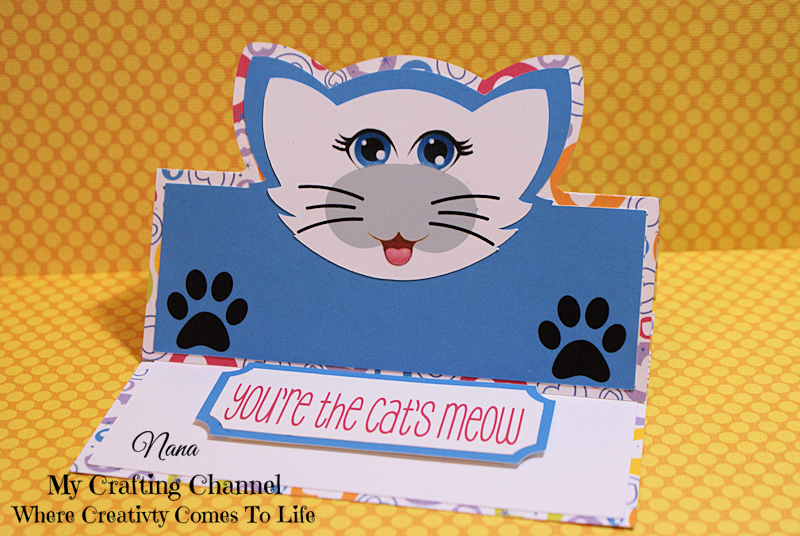 Your easel card is awesome, love the fun design! Fabulous paper and that cat with the paw prints is adorable! The cat has an awesome face! What site did you use? What a adorable easel card!! Love it!! Have a great day. This is really Cute!! Adore the little paws and cat!! You know have I love kitties, and this one is adorable! Okay...this is just too cute! What a sweet kitten and I love the sentiment!